Cambridge Audio CXA80 review | What Hi-Fi? The Cambridge CXA80 has all the hallmarks of a world-class performer. The stereo amplifier sits at the top of Cambridge’s highly successful CX series of products, which have gone from glowing five-star reviews to Award-winning staples of 2015. The CXA80 should follow in a similar vein. It has the sleek, modern look of the CX series, and is just a step higher in price and specifications from its successful sibling, the CXA60. The main differences? The CXA80 has 80W of power (rather than CXA60’s 60W), it costs £750 (a jump up from the CXA60’s £500), and it includes a few more connections. 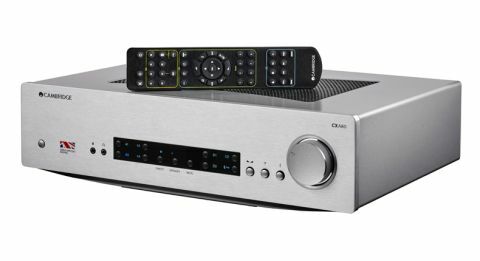 At this price, the CXA80 also has to prove its worth against the long-standing Arcam A19 (£600), which continues to hold onto its five-star rating. The Cambridge may not have a phono stage like the traditional Arcam amp, but it does have a high-resolution DAC built in and a USB input. The biggest difference, however, is sound. What astounds us with the CXA80 is just how detailed and tangible it makes music sound. Play The Shadows’ FBI, and Hank Marvin’s pristine, twanging guitar playing comes through all golden, rounded and rich. Each strum is satisfyingly solid, and packed with weight. The sound is so clean, so clear. It’s impressively precise, and the CXA80 makes every note sound well defined. You get a proper sense that these are real, three-dimensional instruments being played. Drums are hit with the kind of impact where you can feel the tautness of the skin, while crashing cymbals reverberate long after they’ve been hit. You can feel the pluck of strings, and the low basslines rumble on with layers and layers of texture and depth. It's not just the detail; it's also the new found muscle and power that drives the sound of the CXA80. Compared with the CXA60, the bigger sibling is, well, bigger. In every way. The scale is large and grand, with songs given ample space to place each element in the mix. That's why you'll find instruments and voices achieving the kind of solidity that you only get in high-end hi-fi separates. But with all that power comes a cost. For even as the CXA80 impresses us, that added muscle gets ponderous and weighs down the rhythm and dynamics. It doesn’t sound as agile as its rivals and, dynamically, it feels restricted too. Unlike the articulate and balanced Arcam A19, the CXA80 isn’t as expressive with the build up of tension in a song. Oasis’ tracks, for example, don't quite have that jangly tone and nasal edge with the CXA80. Those shortcomings are most clearly heard on folk-indie band Of Monsters and Men’s Yellow Light. Both singers have a similar tone through the CXA80, whereas the difference between the male and female vocals is obvious through the more expressive A19. The emphasis on the end of syllables – the drawing out of certain words – is subtly conveyed through the A19. The CXA80, on the other hand, doesn’t make too much of that distinctive Icelandic lilt. Nor does it have the nimble-footed rhythm to express the sprightly, poppy nature of the song. Those bells have depth and sound like solid objects being struck, but that twinkling edge that gives the folksy tune its sweetness is damped down by the amp’s extra muscle. The CXA80 loses that fluid pacing and the agile melody of the bells and guitar working together to build up the song’s rhythm – it sounds restrained and the melody doesn’t seem to be going anywhere. Admittedly, we’re using our reference £13,000 Naim streamer as our main source, but apart from the analogue connections sounding a touch fuller and subtler, the sonic characteristic of the amp is consistent throughout the rest of the inputs, including the slightly leaner sounding USB. The on board DAC (which is the very same DAC found in the CXA60) is decent, and the convenience of having a DAC built into the amplifier will appeal to many. The addition of the asynchronous USB type B input is the main upgrade on the CXA80. If you’ve got plenty of music stored in different files sizes and file formats on your laptop or computer, all you need to do is plug your laptop straight into the USB socket and press play. It’s that simple. From CD-ripped WAVs to 24-bit/192kHz FLAC files, the Cambridge’s internal DAC handles them all. There’s no phono stage built in, but you can plug in your own into any of the CXA80’s four line level inputs. Along with the pair of balanced XLR inputs and 3.5mm input on front for music players, that’s plenty of connections for your sources. There are also three other digital inputs: one coaxial, two optical, and they can all handle hi-res. You’ll be tempted to stick your smartphone’s charging cable into the other USB port at the back, but the CXA80 doesn’t have any charging powers. Instead, that USB port is designated for a Bluetooth dongle (Cambridge offers the BT100 for £70) that lets you stream songs wirelessly from a smartphone. We also like that Cambridge has continued its tradition of labelling all connections in both orientations, meaning you can easily read the input names when leaning over the amp. It’s a small, but very thoughtful, touch. The CXA80 gives you scope to bi-wire your speakers or run a second pair thanks to two pairs of speaker terminals, and there’s also a 3.5mm socket on the front panel for your headphones. Peek through the heat vent on top of the unit (which keeps the Class AB amplifier cool) and you’ll see a large toroidal transformer smack in the middle of the CXA80’s symmetrical circuitry. The Cambridge amplifiers are designed to keep the left and right channels as separate from each other as possible, and the CXA80 takes this one step further by having separate transformer taps for left and right channels (instead of a single one as found on the CXA60). On the outside, the CXA80 is a gorgeous modern design. The floating design and brushed aluminium finish (in silver or black) looks sleek and classy. Every part of the Cambridge amp – from the front panel buttons, the smooth curved edges of the chassis, the input names lighting up in blue – is exquisitely detailed. It feels every inch a quality product. It performs just as admirably, too. All the buttons click satisfyingly, the rotary volume dial has the perfect amount of resistance, and even the tonal controls (indicated by the bass and treble clef icons) feel lovely to use. The only visible difference from the CXA60 is that when selecting the USB input, the icon goes red instead of dark blue like the other inputs. We particularly like the shiny metal accents on the large volume control. The included remote control makes life even more fuss-free. It’s a good quality build, with the soft rubber finish feeling nice in hand. All the buttons are logically laid out, and every action responds without a hitch or delay. We expected the CXA80 to blow us away. We expected it to perform beyond the CXA60, and to overtake the A19, but in the end, the Cambridge amp didn’t wow us the way we wanted it to. That doesn’t mean it’s not an impressive product. In design and use, the CXA80 is a lovely piece of kit. We can’t applaud the Cambridge enough for just how sleek and effortless the amp looks and feels. And it’s a clear step up in many ways from its younger sibling and the Arcam rival: its large-scaled performance is powerful and the refined sound is wonderfully solid. There’s plenty to admire about its remarkably tactile sound. But the ponderous nature that takes away some of that sparkle and liveliness is hard to ignore, especially at this price. In comparison, the light touch and snappy rhythm found on the superbly balanced A19 and the enthusiastic CXA60 are simply more entertaining to listen to overall. The Cambridge CXA80, however, is a tempting solution if you want a powerful amplifier with a decent on board DAC – you definitely need to give it a whirl.